Wolf Wire Forms, produces premium quality stainless steel Duo Lock Snaps and Split Rings. If you can use high quality American Made Duo Lock Snaps and Split Rings in your production, or to include in your product line, please contact us and we will be happy to help you! Tied directly to the line, it can be used to attach a hook, lure, or shock leader. Add a swivel to control line twist produced by a rotating bait. Add a 3-way swivel to make speciality rigs, such as dropper or flounder rigs. Use them in making wire, monofiliment, or chain leaders. Angled cut off: Makes assembly more efficient. Tightness of coils: Reduces ring profile and improves lure performance by not interfering with hooks. Parallelism of coils: Ensures that the ring was pressed properly and the ring's strength was not effected. Material: High quality stainless steel spring wire is used to assure high tensile strength and corrosion resistance. 1/0 10 lbs. .190" .020"
1 10 lbs. .205" .024"
2 20 lbs. .244" .028"
2 H 30 lbs. .248" .032"
3 25 lbs. .287" .032"
3XH 60 lbs. .296" .039"
4 30 lbs. .310" .035"
4XH 80 lbs. .315" .047"
5 45 lbs. .350" .039"
5XH 100 lbs. .350" .050"
6 80 lbs. .410" .047"
6XH 120 lbs. .423" .055"
8 80 lbs. 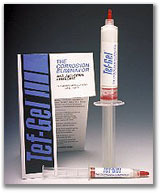 .490" .047"
Tef-Gel's amazing composition is derived from a specially formulated PTFE paste which allows use in all weather conditions to prevent rust, corrosion and siezing. Whether it swivels, squeaks or slides, Tef-Gel is the lubricant which will insure the future removal of all assembled hardware. Also the Full Line of Ultra Safety Systems Pump Switches and Alarms. The best Bilge Pump Switch Ever Designed!